Polycrates, the tyrant ruling Samos during the second half of the sixth century BC, was a powerful figure, the first Greek to rule the 'seas' within the reliable historical memory according to Herodotus, described in the sources as a serious partner for the superpowers of his time - the Saïte dynasty of Egypt and the newly emerged Persian Empire. His story is thus connected to the contemporary power politics of the whole eastern Mediterranean. On the other hand, the understanding of the rule of this famous tyrant could shape our views of Archaic Greek tyranny as historical phenomenon. Although understanding tyranny per se is not stated as the purpose by the author, her emphasis on the economic basis of Polycrates' power clearly contributes to this field. The book, based on her doctoral thesis in the UCD School of Classics, states as its purpose to answer several particular questions related to Poycrates' rule, most of which contribute to understanding the power basis of the tyrant. Carty synthesises the archaeological data, the evidence from inscriptions, the contemporary literary record (mainly the scarce fragments of Ibycus and Anacreon), and the later tradition among which Herodotus stands out. Her list of modern literature is generally representative, with a surprising omission of De Libero's monumental treatment of Archaic tyranny where the tyranny at Samos is discussed for more than fifty pages. 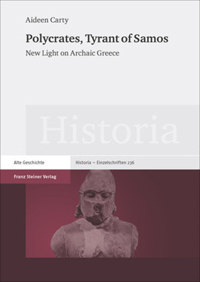 In the eight more or less chronologically ordered chapters Carty creates a coherent picture of the political development of Archaic Samos from Polycrates' predecessors to his short term successor Maeandrius, integrating the Samian events with the developments in the adjacent regions. Carty pays attention to the monarchic predecessors of Polycrates, dating the basileus (king) Amphicrates mentioned by Herodotus (3.59) to the late seventh, and the shadowy monarchia of Demoteles (Plut. QG 57) to the early sixth century, but discounting the evidence concerning the enigmatic first Polycrates (Suda, s.v. Ibykos; Himerius Or. 29) as unreliable, removing Syloson the son of Calliteles (Polyaenus 6.45) to the fifth century, and suggesting the identification of the aisymnetes Phoibias (Theodorus Metochites Miscell. 668-669) with the famous Prienian sage Bias. The government established by the admirals overthrowing the oligarchy of geomoroi (landsharers) ruling after the end of Demoteles' monarchia (Plut. QG 57) is identified with the halieis ('sea-men') mentioned by Anacreon (fr. 353 Campbell), which creates the vision of competition between two factions in the course of which the faction of landowners was ousted from power by the group with maritime interests. Carty however does not interpret this rivalry as landed aristocracy versus commercial noveau riche, but as more or less equal elite groupings, even suggesting the possibility that the geomoroi may have held their property in the Samian possessions on the mainland (peraia) and counted as comparatively recent newcomers among the elite. The family of Polycrates belonged, according to Carty, to the halieis dominating Samos from the first half of the sixth century and engaged in maritime trade and piracy. Thus Aeakes son of Brychon mentioned in a dedicatory inscription in the Samian Heraion (IG XII.6.ii.561) and identified as Polycrates' father is viewed as an official with quasi-tyrannical power responsible for collecting tax on booty from naval raiding, which effectively concentrated the resources and the control of naval power into his hands. Carty does not discuss how Polycrates assumed the authority in the polis together with his two brothers, an event briefly mentioned by Herodotus (3.39). However, she interprets a plot described by Polyaenus (1.23), which is usually considered as pertaining to this event, as the description of how Polycrates ousted his brothers and began to rule alone, which she views as the virtual establishment of his tyranny. However, when roughly synchronizing the accession of Polycrates with the fall of the Lydian empire (traditionally 547 BC), Carty does not make clear if this is to be understood as either the beginning of the joint rule or of the subsequent sole rule. Carty consistently emphasises the importance of naval looting as the economic basis of Polycrates' power. Particularly, she points out the importance of the enslavement of captives, and suggests that Polycrates profited from supplying Amasis, the king of Egypt, with soldiers, not voluntary mercenaries as usually assumed, but enslaved men having the chance to be manumitted after service. The Greek port Naucratis in the Nile Delta thus appears as the principal channel for importing the slave-soldiers, and the supply of this manpower as a key issue in the politics of the period. The Egyptian rulers had previously received soldiers mainly from Lydia, but found a new supplier in the Samian tyrant when the Persians conquered the Lydian state. This was the principal reason for the friendship between Polycrates and Amasis, while on the other hand, it provoked the enmity of the Spartans, the previous friends of the Samians who felt that Polycrates had excluded them from this lucrative trade. After the Persian conquest of Egypt Polycrates looked for replacement of this income, which led to scheming with the Persian satrap Oroites, a supporter of the Persian rebel Bardiya according to Carty, and allowed Oroites to trap and kill the Samian ruler. Polycrates' successor Maeandrius, a war captive and manumitted slave of the tyrant, was involved in the murder and subsequently ruled Samos as Oroites' protégé, but was soon removed by the new Persian king Darius who could not allow the island to be governed by a pawn of the satrap implicated in Bardiya's revolt. This reconstruction, even if plausible, remains largely hypothetical. The contemporary literary evidence is too fragmentary for a consistent reconstruction of events, and the later tradition is probably less reliable than Carty sometimes assumes. 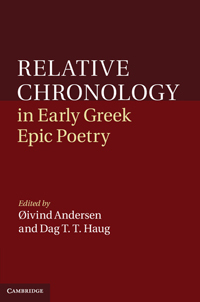 She admittedly takes into account the oral background of the traditional evidence, the narrative patterning of Herodotus' account, and the constructed nature of the traditional chronology, but does not always realise the full implications of this. Discussing the different strains of tradition for separating the manipulated accounts from the reliable ones, she does not wholly recognise that oral transmission inevitably involves intentional or unintentional manipulation, and that no traditional stories can therefore transmit a wholly reliable truth. This concerns especially the alleged motivation of the actors which is likely to reflect the views of the story-tellers rather than the actors themselves. The reader can therefore feel that the scraps of contemporary record and the traditions of debatable reliability on which Carty builds her complex and sophisticated synthesis cannot always bear the conclusions she draws. Carty can indicate possibilities, but hardly provide more or less conclusive proofs. This also pertains to the thesis of Polycrates' supply of the soldiers to Egypt. Carty convincingly demonstrates the importance of looting for the Samian elite and particularly Polycrates, and can be followed by the suggestion that the tyrant mediated soldiers to Egypt, but she cannot provide evidence for their enslaved status. She demonstrates that unfree soldiers were used in the eastern armies, and that the Greek evidence does not always prove that the Greeks fighting in Egypt were free mercenaries, but she supplies no evidence suggesting that any Greek author ever believed that they served as slaves. The provocative thesis of Greek slave-soldiers remains highly debatable. Nevertheless, the book is an interesting and valuable read, not to be missed by anybody interested in the history of Archaic Greece or the Greek tyranny. It reveals the traditional nature of the sole rule in Archaic Samos, in which context the tyranny of Polycrates appears as a continuation of the earlier practice on a more magnificent level rather than a break with the past. Above all, it pays due attention to the economic basis of the tyrannical power, demonstrating how resources attained from systematic looting and control of trade networks secured by the diplomatic relations with the Egyptian king granted Polycrates the power over his native island and the loyalty of the majority of the people. L. De Libero: Die archaische Tyrannis. Stuttgart 1996, 249-310.